Boxing day for us is a nice indulgent work free day, when you have time to play with your new toys, or start that craft project you have been meaning to do. I took up my needles and started making some things for me, after a long stretch of present making or making products for my online shop and the gallery. Himself got out the frame loom we ‘accidentally’ bought back in the summer. 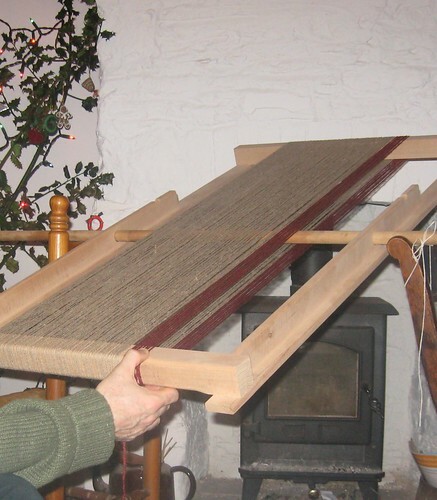 He warped up and using some thrum ends of wool from Coldharbour Mill, started to weave. What do make? he asked. Always good to have something in mind when making. 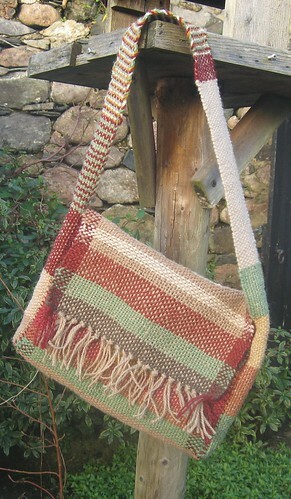 A peg bag says I – then he could try lots of different ideas out, and it will be useful too. So he began and as life returned to normal the weaving was done in the evenings by the fireside, and by new year’s day, he had finished. Not bad for a first go eh? I’m now thinking of lots of projects I want to try out too, whilst himself is thinking of trying out the big floor loom we were gifted…. Wow I *LOVE* that. 🙂 so clever !!! !